Abdal khan is a prisoner of geography. A resident of Nimli village in Rajasthan’s Alwar district, Khan, who claims to be over 100 years old, is mostly bedridden in his home nestled in the foothills of the Aravallis. He stays quiet most of the time, but a mention of the Aravallis triggers an outburst. “I have accompanied British officials on hunting tours on these hills. Where we are sitting now was once a thick forest,” he says. There are only a few like him alive, who can remember the once ecologically rich Aravallis and also witnessed its gradual demise. His youngest daughter, Dini Bi, who is half his age, lives some 50 km north in Banban village of the same district, also located in the mountain range, which has almost disappeared. While Khan laments the loss of forests, his daughter is not so mournful. “It was good when the mountain was there. But mining gave us jobs,” she says. This is the chronology of the dying Aravallis. Within one generation, millions who once found it the axis of their sustenance, are now reconciled to the loss of one of the planet’s oldest physical features. This despite the fact that village after village have reported changes in the local ecology after the mountain range’s degradation, with significant impact on the people’s lives. The account of Khan is a telling comment on the degradation the Aravallis due to mining. Though the Supreme Court banned mining in the range in 2002, unless cleared by the Union Ministry of Environment, Forest and Climate Change (MoEFCC), illegal mining has continued, sometimes on a scale even larger than that of legal mining operations. A 2018 report by Supreme Court-appointed Central Empowered Committee (CEC) says that 25 per cent of the Aravalli range has been lost due to illegal mining in Rajasthan since 1967-68 and over 10,300 hectares (ha) have been affected outside the lease boundary in the 15 districts where 80 per cent of the Aravallis are located. “Extent of illegal mining in terms of percentage area exceeds 100 per cent in many cases, especially in respect of smaller mines allotted for minor mineral,” the report says, which was based on satellite images of 2008-2010. While the committee recommended the Rajasthan government immediately stop all mining activities outside the legally sanctioned mining leases and identify and prosecute those involved, experts and activists working to conserve the Aravallis rue the poor implementation of the laws on the ground. A 2017 Comptroller and Auditor General of India (CAG) report says 4,072 cases of illegal mining, transportation and storage of minerals have been registered between 2011-12 and 2016-17. Around 9. 8 million tonnes of minerals were found to have been illegally excavated. The Aravalli mountain range that spans four states—Gujarat, Rajasthan, Haryana and Delhi—was never continuous, but mining and construction activities have made it even more broken. Of 128 hills/hillocks of Alwar district in Rajasthan that were sampled from the total 2,269, it was observed that 31 hills/hillocks have vanished from the time the Survey of India topographic sheets were prepared in 1967-68, says the CEC report. The gaps were recorded by satellite pictures and verified on the ground. “Just recently we witnessed a hillock in Mokhampura village on National Highway 8, some 70 km from Jaipur. Half of it is eroded and it will be completely lost in another year,” says Ambuj Kishore, programmes director at Association for Rural Advancement through Voluntary Action and Local Involvement, an organisation set up by the Rajasthan government to promote voluntary action for the state’s socio-economic development. Degradation of Aravallis is also evident in the loss of forest cover. During 1972-75, the Aravalli districts in Rajasthan recorded 10,462 sq km of area under various categories of forest. By 1981-84, the forest cover reduced to 6,116 sq km, says a 2018 report by Delhi-based Rajiv Gandhi Institute for Contemporary Studies (RGICS). Haryana has a similar story. Of its 22 districts, Aravallis are present in Mewat, Faridabad, Gurugram, Mahendragarh and Rewari, all of which are currently, or were till recently, heavily mined and have undergone rapid developmental and construction activities (see ‘Mountain of troubles’). In Gurugram’s Harchandpur village, the groundwater has severely depleted due to mining and stone-crushing units in surrounding areas and mushrooming of real estate projects in adjoining districts. 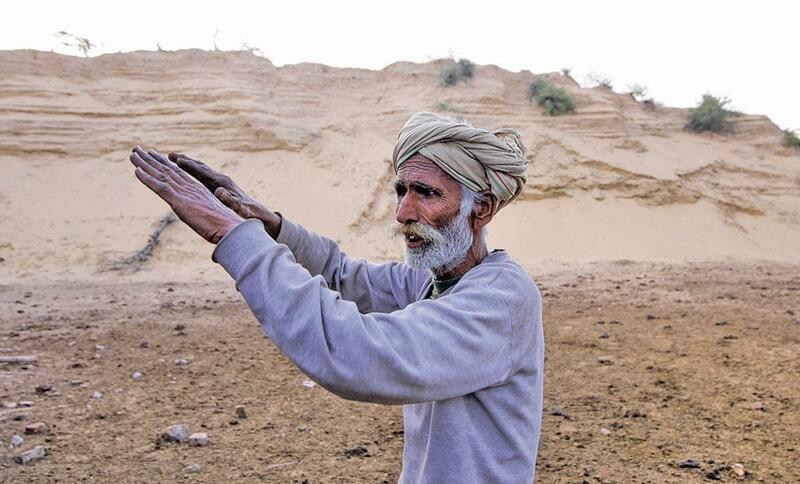 Raja Ram Bhamla, a farmer of Harchandpur, says that two decades ago, water was available at a depth of about 10 m, but now one has to drill 150 m. “The Aravallis no longer provide fodder, nor bring rain. As a result, groundwater is depleting due to over-extraction and the fields are turning into a desert,” he says. The depleting groundwater in Harchandpur has had another side-effect. It has triggered a termite epidemic. “The presence of water chokes the pores of the soil and kills termites. But when the soil becomes dry, termite attacks increase,” says O P Yadav, director of Central Arid Zone Research Institute, Jodhpur, Rajasthan. The termite problem has, in turn, triggered changes in crop patterns. Earlier, farmers in Harchandpur grew pulses. But now they have shifted to water-intensive mustard and wheat because the water protects the crop from termites. But since the crops are water-intensive, the farmers extract more water from the ground and the vicious cycle is draining the groundwater. Like Rajasthan, Haryana too is losing forest cover. A study by the Wildlife Institute of India (WII) said that while green cover has declined in Haryana between 1980 and 2016, human settlement has increased by 158 per cent, from 247 sq km to 638 sq km, in the same period. At the same time, the area taken up by the industries has gone up from nil to 46 sq km. Government agencies themselves are party to Aravallis’ destruction. In Manesar, over 16,000 fully grown trees on 23 ha of forestland were chopped off without permission between 2011 and 2013 to set up police lines, shows a 2018 RTI query filed by Ram Avtar Yadav, a farmer and former sarpanch of Manesar, Haryana. In fact, the police department has been acquiring forest land to build various residential and training complexes on land marked as “forest”, without requisite permissions, over the years, alleges Yadav. A police training institute has been set up in Bhondsi village of Gurugram, for which over 4,500 trees were felled, even as the proposal from the police department for permitting the construction lies with the forest department. “Yes, we have noticed violations. The institute should not have come up without permission. They acquired the land from the village panchayat. The complaints have been sent to MoEFCC and action will be taken,” Deepak Nanda, district forest officer, Gurugram, told Down To Earth. Yadav also points out that the boom of the real estate sector, especially in districts around Gurugram, has led to the laying of unwanted roads. “There are some areas where roads are already there but new roads are being built just to increase the value of the property,” he says. In Gujarat too, illegal mining in Banas-kantha, Sabarkantha and Aravalli districts—the three districts where the Aravalli range spans—has adversely affected the ecology. “The Balaram Ambaji sanctuary, a protected area, in Banaskantha too is bearing the brunt of mining,” says Ashok Shrimali of Mines, Minerals & People, an Andhra Pradesh-based non-profit. Earlier, the hills across the four states provided rich habitat to wildlife—tigers, leopards, wolves, blackbucks, Indian gazelle, desert fox, the great Indian bustard, migratory common cranes, ducks, coots and pelicans. But now only the relicts are found at places like Ranthambhor, Sariska and Kumbhalgarh in Rajasthan. Even the Delhi ridge, the last stretch of Aravallis, in the northern part of the capital, has been encroached upon. “The massive exploitation of the ridge has made it unrecognisable. Huge residential colonies, religious institutions, university campus and security force camps have been set up. This has made the landscape flat, like the plains,” says Ravi Agarwal, director of Delhi-based non-profit Toxics Link. The ridge acts as lungs for the city’s polluted air; helps maintain reserve of drinking water; and, protects it from desert sands blowing from Rajasthan. In all the states, the depleting groundwater has fuelled the growth of invasive species that thrive on minimal water. “Indigenous trees have disappeared and there is a preponderance of kikar (Julifora prosopis),” says Bilal Habib, researcher at WII. “Unlike kikar, the indigenous varieties were broad-leaved, which retained more water and played a key role in the ecology of the mountains, helping in rain formation. When kikar spreads, the area is still green but it is a green desert,” he adds. Meteorological department data shows that Alwar has not received average annual rainfall since 2009. “Sand dunes and desert vegetation have even become visible in certain parts of Haryana’s Sohna town,” he says. Small wonder, when the Haryana government amended the century-old Punjab Land Preservation Act, 1900, on February 27, it faced public anger. The amendment opens up 25,000 ha of forest areas in the Aravallis for construction and mining. It also legitimises the illegal construction and mining that has already happened in the area. On February 28, environmental activists such as Chetan Agarwal, an independent environment policy analyst based in Faridabad, organised several protests in Gurugram and Faridabad against the legislation. The activists also went to the Supreme Court and on March 1, the court stalled implementation of the amendment. The decline of the effectiveness of the Aravalli hills as a source of structural control for normal weather and climate can be gauged from the shrinking of the duration of rainy season (from the day of onset of monsoon to the day of its withdrawal)— from 101 days in 1973 to just 25 days in 2009, says Narpat Singh Rathore, former head of department of geography at Mohanlal Sukhadia University in Udaipur, in a 2009 study on the Aravallis. Similarly, the total number of rainy days has declined from 60-80 days per year to 18-30 days. According to a 2017 WII report, the hills checked the spread of the Thar Desert towards eastern Rajasthan, the Indo-Gangetic Plains, Haryana and western Uttar Pradesh. But the 2009 report by Rathore, which analysed remote sensing data of 1972-75, 1982-84, 1994-96, and 2005-07, reveals that the desert sand is drifting towards northeastern plains through 12 identified gaps in the Aravallis, extending from Magra hills in Ajmer district to Khetri-Madhogarh hills in Jhunjhunu district and northern-most hillocks in Mahendragarh district of Haryana, totalling 93 km. The study identifies Dungarpur-Banswar gap area on the Aravalli range, Upper Banganga Valley, Magra Area, Girwa-Gogunda tract, Jaisamand Lake area, Daragarh-Banara-Maja-Dariba area, Abu-Sirohi and Chappan hills of South Aravalli as “extremely most vulnerable”. A serious ecological impact of digging or mining to a great depth is puncturing of aquifers, which disturbs the water flow, results in drying of lakes and popping up of new ones. One such case has been seen in Faridabad, Haryana. The RGICS study says that Bharadwaj lake, apparently named after the contractor who was allotted the contract for red silica in that area, has been observed in the district. “The lake points towards a possibility of illegal mining. 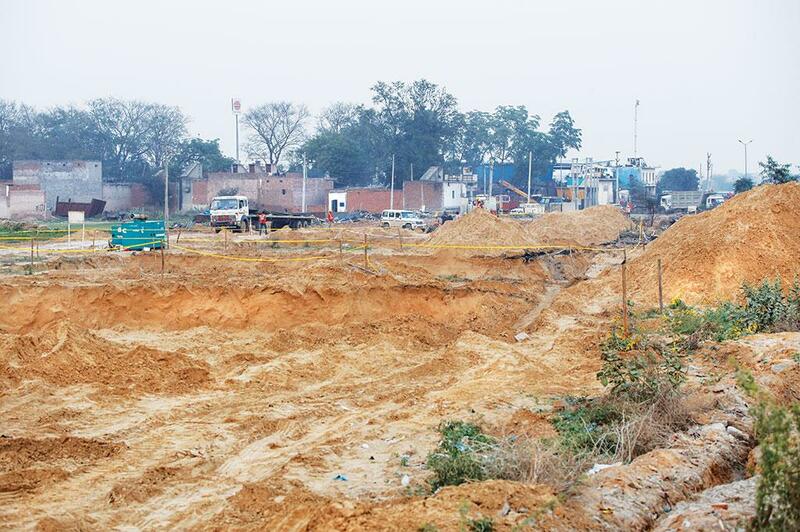 The Faridabad mining department, however, claims that no one named Bharadwaj was allotted a mining lease in that area. Several reports have also confirmed the vanishing of rivers like Banas, Luni, Sahibi, Indori and Sakhi, which originated in the Aravallis, says WII. The denudation of forests along the northern and central Aravalli tracts is also increasing intensity of dust storms. Last year, for instance, several dust storms hit north-west India and were unusual in terms of intensity, frequency and character. While between 1980 and 2003, India saw nine deadly convective storms, which killed some 640 people, in the next 14 years—2003 to 2017—22 storms were recorded, which left some 700 dead. In 2018 alone, 50 such storms and 500 deaths were reported till July in northeast of Aravallis. So what is the way out? The developments so far indicate that legal route is, perhaps, the surest way to protect the Aravallis. The British were the first to recognise the importance of the range and declared parts of it as a reserve forest under the Indian Forest Act of 1878. Later, additional areas got protection under this Act. In 1900, the British enacted the Punjab Land Preservation Act (PLPA), which prohibited mining, clearing of forest or land for cultivation. This protection, however, applied only to a small portion of the Aravallis in Haryana, which was then part of the Punjab region. After Independence, there were little legal efforts by successive governments to protect the mountain range. In the mid-1980s there were people’s movements to save the Delhi ridge. Non-profits like Kalpvriksh, the World Wide Fund for Nature (WWF) and Srishti spearheaded the public campaign. In Rajasthan, Rajinder Singh of Alwar-based non-profit, Tarun Bharat Sangh, led a movement to save the Aravallis from mining activities in 1988. Though these awareness movements brought the issue in the public domain, it could not stop the rampant destruction. So, the only way left was legal intervention, and a few landmark judgements attempted to offer respite. In 1985, environment lawyer M C Mehta filed a petition in the Supreme Court against the Union government, Haryana government, central and state pollution control boards and 65 stone crushing companies that were operating on the outskirts of Delhi. The Supreme Court slammed the Haryana government and asked it to relocate the industry. In 1991, Tarun Bharat Sangh filed a petition in the apex court demanding a ban on the widespread illegal mining inside the Sariska Tiger Reserve area. The court appointed a committee headed by a former judge of the Rajasthan High Court to check the claims. The committee confirmed illegal mining, and in April, 1993, the Supreme Court imposed a ban on illegal mining in the protected areas. Though the judgement set a precedent for all cases related to mining in the protected areas, activists allege that mining is still going on in and around Sariska. Taking note of these rulings, MoEFCC issued an unprecedented notification on May 7, 1992, known as “The Aravalli Notification”. This notification clearly prohibits the setting up of new industries, mining, deforestation as well as construction activities, including roads and laying of transmission cables, without the prior permission from MoEFCC. “This notification proved to be an important stepping stone to conserve the Aravalli range and the forests around it,” says Singh. The destruction of the mountain range primarily has to do with land ownership and how various interest groups have tried to circumvent the law or disobey court orders to enable either mining or construction activities. On paper, a number of government agencies claim ownership rights. These include the forest department, the revenue department, the Central Public Works Department, the Delhi Development Authority and the Land and Development Office. This situation has arisen ever since India enacted the Forest (conservation) Act in 1980 (FCA). Many state governments went on to de-notify forest areas and kept a sizeable part of forests out of the purview of FCA. That’s because if any state government wants to use forestland for non-forest purposes, it has to get the consent of MoEFCC, which is a laborious process. In some cases, state governments have amended their own laws to accommodate diversion of land. For instance, the antecedents of the Haryana government’s February 27 amendment to PLPA can be traced to the case of R Kant & Co. In 1984, the Haryana government first de-notified PLPA lands and declared it as revenue land. Then it amended the Haryana Development and Regulation of Urban Areas Act, 1975 to convert more than 202 hectares of PLPA forestlands for commercial use. But Supreme Court put its foot down. In 2018, the court rejected this amendment and said that PLPA lands should be considered as forestland. Despite the “Aravalli Notification” and the subsequent Supreme Court’s judgements, states have found ways to violate norms in more ways than one. Rajasthan, for instance, has been renewing the mining leases in the mountain range without taking clearances from MoEFCC. They are doing so by taking recourse in their defunct rules. Since the states were defining forests to suit their needs and grant forestlands for non-forest uses, the Supreme Court, in the T N Godavarman v Union of India case in 1996, cleared the confusion and said “the word ‘forest’ must understood according to its dictionary meaning of the term irrespective of the nature of ownership and classification thereof”. The judgement stated FCA would be applied on every forest, irrespective of their nature of ownership or classification. The Supreme Court had then directed all state governments to identify all such areas. But state governments have found a way to tweak these directions. “The Haryana government has come out with a list that includes only those areas which was under the forest department and left large chunks of forest areas that it wishes to use for non-forest purposes,” says Rahul Choudhary, a senior environmental lawyer. The problem is that there are laws and judgements for state governments to enforce the rules. But this does not happen. Even as numerous cases are being fought in various courts, the destruction of the Aravallis continues unabated.